Sunfire CRM-2 Cinema Ribbon Speakers. Condition is Used. Excellent condition both electronically, and cosmetically with only minor wear on the fabric edges. No tears etc.Shipped with USPS Parcel Select Ground. Sunfire XTEQ 8" High Performance Subwoofer. Woofer Magnet 6.3” x 2.75” Deep. Phase 0 to 180 degree (variable). Slave Line Level - Mono (RCA). Amplifier Power 1,800 Watt. Slave Line Level – Mono (RCA). The Atmos subwoofer has an automatic equalization system which will tailor the subwoofer output to compensate for any room effects. Great bass performance through thick and thin. The role of any Surround is to keep the woofer on the straight and narrow as it moves back and forth. 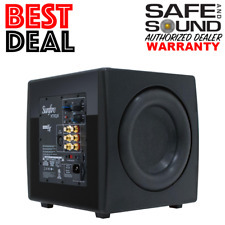 Sunfire True Subwoofer IV Works Perfectly! Rare! Sunfire HRS SAT4 Stereo Speakers with Sunfire HRS SAT4 Stands. They are also high-quality and dependable. Furthermore, the wide frequency response of these Sunfire speakers enables you to perceive crystalline highs and ultra-low bass notes. Sunfire D-10 Subwoofer 1000 Watt 10” Sealed Active Sub 120 230 V Dominator HRS. Condition is Used. Shipped with UPS Ground. Co -winner of their A/V processor of the year. If you like surround try wrapping yourself in a full 9.1 surround. Orange lights don't light up. Beautiful Sunfire HRS-10 Powered Subwoofer. You are Sunfire 10" powered subwoofer. Condition is Used. This is a Sunfire HRS-8 8" High Resolution Series Subwoofer. Item is in very good used condition. No major scratches or scuffs (just normal minor ones from normal wear --- see pics). Plate amp refurbished by Sunfire, new foam surrounds on woofers. Sunfire HRS10. If your subwoofer puts out less than 1000 Watts, it’s not an HRS Series subwoofer. All HRS subwoofers produce this prodigious sound in a cabinet no larger than the size of your monitor. Sunfire True Subwoofer Architectural. Mint Condition. 12 Inch. Sunfire True Subwoofer Architectural. Mint Condition. 12 Inch.. Condition is Used. Shipped with UPS Ground. Tested - fully functional. You will get what is shown on the pictures. Woofer ConstructionCustom, High Excursion Woofer. Enclosure FinishBlack Gloss. Speaker Level : 5.6k ohms (Ohms). Input ImpedanceRCA : 30kohms. Max SPL106. This is a used Sunfire Theater Grand Processor TGP-1. Comes with original box. SUBWOOFER IS IN VERY GOOD CONDITION, SOUNDS GREAT, BIG POWER.